With the Sentinel-1 expected to be launched at the end of 2013, ESA is already funding activities to study the next generation of C-band SAR instruments. One of the drivers for these development is the strong user requirement for high resolution and wide swath (HRWS) operations. Future HRWS systems will break the classic direct trade-off between azimuth strip-map resolution and achievable swath. The key to achieve this is the use of Multiple Azimuth Phase centers (MAPS), which allows decreasing the PRF (thus allowing a wider unambiguous swath) while maintaining the number of azimuth samples.In addition, multiple channels in elevation will allow the the use of Digital Beamforming (DBF) techniques such as Scan-on-Receive (SCORE), in this case to relax the trade-off between antenna gain and swath width. The availability of multiple receive channels and the use of DBF will give future systems new degrees of freedom with regard to how they are operated. In this context, the German Aerospace Center (DLR) is leading a ESA funded activity to assess the Ground Moving Target Indication (GMTI) and Along-Track Interferometry (ATI) potential of the current reference post-Sentinel-1 architecture. One particular area of interest in the use of ATI for ocean current estimations. This paper reports on some key findings of this activity. The current reference system features a 12.8 m long antenna divided along-track in 8 panels which, on receive, are sampled independently. In transmitt, the full antenna is always used in order to harvest all the available RF power. For high resolution operation modes, the azimuth transmitt pattern needs to be broadened so that the beam width approximately matches that of a single receive element. This is achieved using phase spoiling techniques. The same system can be run in a lower resolution mode simply by narrowing the transmit beam (for example by using a linear phase tapering in azimuth). In this case, the multiple receive-channels can be added directly on-board, thereby significanly lowering the data rate. A more interesing alternative use of the available channels is to view the system as a GMTI or ATI system. In these techniques the system must be able to generate multiple independent SAR images. For example, if we consider a ATI configuration in which we want to interfere a SAR image obtained with the four fore receive panels with the one obtained with the four aft panels, the SAR performance needs to be derived considering only this half-length receive antenna. The shorter receive antenna leads to a wider receive azimuth-pattern that translates to a larger Doppler bandwidth which in turns leads to a higher PRF requirement. There is, nevertheless, a more complex trade-off space if the required Azimuth Ambiguity to Signal Ratio (AASR, which may be relaxed for ocean applications), and the required azimuth resolution (which may also be relaxed) are considered. To investigate the final performance in terms of surface current velocity estimation errors, a full simulator is being implemented. This simulator generates multi-channel raw data corresponding to a time-varying simulated ocean surface that includes all main enviromental effects, and uses prototypes of the proposed processing algorithms. A detailed performance analysis in terms of final ATI performance vs. PRF will be presented in the full paper. GMTI techniques typically need at least three phase centers in order to be able to, simultaneously, suppress the non moving ground-clutter and estimate the motion parameters of the moving targets. In addition, many GMTI algorithms require that the Displaced Phase Center Antenna (DPCA) condition is fulfilled, that is, that the PRF is chosen such that coregistration is achieved simply by shifting the data by an integer number of azimuth samples. For the reference architecture, assuming that all the eight phase centers were used for GMTI processing, the full DPCA condition would lead to a unacceptably PRF of approximately 9.3 kHz. This PRF can be halved if pairs of adjacent channels are added together, thereby turning the system in an equivalent 4 channel one. A possible alternative strategy under investigation is to restrict the GMTI processing to N overlapping phase centers. For example, taking N=3 the required subset-DPCA PRF would be 1.9 kHz, which is a moderate increase with respect the nominal HRWS mode PRF of 1.2 kHz. This subset-DPCA approach has the drawback that, from a SAR imaging point of view, it does not make an optimum use of the system resources. Furthermore, to reduce the width of the blind velocity ranges, a narrow-band clutter Doppler-spectrum is desired. 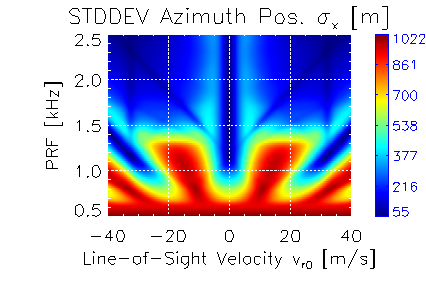 This is achieved using a narrow transmit beam, which leads to a larger (worse) azimuth resolution. Altogether, GMTI requirements are in conflict with both the wide-swath and the high resolution requirement. Figure 1 shows an example of the achievable GMTI performance as function of the PRF for a target with a RCS of 2 square meter, in a clutter environment characterized by a NRCS of -10 dB. As a performance indicator the standard deviation of the azimuth position error (which is also proportional to the cross-track velocity estimation error) is given. It is clear that ATI and GMTI modes are in conflict with the nominal HRWS requirements. This may not a problem in the open seas, since for ocean related applications high resolution is not required (nor achievable, due to the fast temporal decorrelation of the ocean surface), such that dedicated modes may be an option. For land and coastal areas it is intriguing to determine the performance in the case of non optimized mode. Here, an interesting option is to condider processing-defined modes, for example, to consider the GMTI or ATI performance of a nominal HRWS mode if the azimuth resolution and ambiguity suppression requirements are relaxed in processing. This analysis will be also presented in the full paper.